And Cairo woke up today on 3 bombings killing at least five and injuring dozens early morning in Cairo and Giza targetting security checkpoints and directorates. The biggest explosion is at Cairo security directorate. 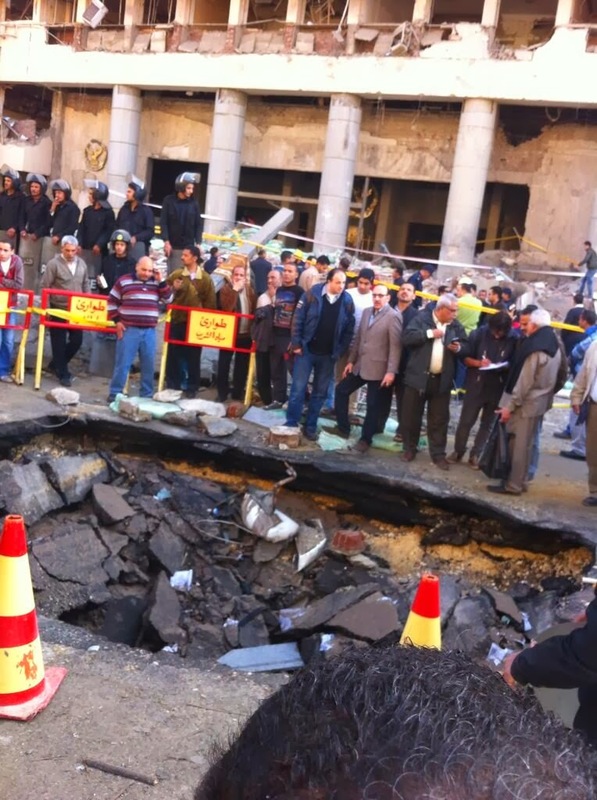 The Cairo security directorate in the heart of Cairo was badly damaged along with the Islamic Museum. That series of the explosions come 24 hours prior the 25 January revolution anniversary. Some say Ansar Beit Al Maqdis claimed responsibility at their shady private twitter account while others use the own words of the Muslim Brotherhood members and supporters only that "we are going to have one hell of a week" to the end of that talk. The TV channels now are full of commentators , strategic analysts and angry callers are asking the authorities ever woman,man and child of the Muslim Brotherhood as well to bomb Gaza..to the end of that talk. Of course those TV channels won't waste the opportunity and remind people on how Egyptians are in desperate need to elect General El Sisi as a president in order to conquer terrorism .. and the whole world and universe as well. Amazingly after the horrible bombing at the Cairo Security directorate , we find dozens of citizens in the crime scene carrying the photos of both El Sisi and Ibrahim of interior cursing the brotherhood. Well you are going to fight terrorism for real if you start to treat the explosion site as a crime scene and stop turning it on a political theatre. Earlier this week we found the minister of interior Mohamed Ibrahim bragging proudly that "No one will dare and come close to any police station on 25 January like what happened 28 January 2011 other he will find .." and the MOI started sharing photos of police stations and checkpoints with rockets installed and big guns everywhere ,well the terrorists are telling Ibrahim one thing as I see it "In your face". I think in a civilized society instead of carrying the photos of Ibrahim in the streets in stupid jubilation , he will have to answer lots of questions and he may lose his position. In fact not only him but many officials in the National security should answer lots of questions because since August 2013 terrorism did not stop and actually is getting bolder as we see now. There is an intelligence failure along with security failure but no one wants to speak about the elephant in the room. The Islamic Museum is horribly damaged. Here are photos from inside the museum.